The last day of Girls Weekend in West Hollywood meant one last chance to try out a new studio. Stuido10 was less than a mile from the hotel and literally right up the street and around the corner. Seemed like a great option! Studio10 is an unassuming space across the street from the Pacific Design Center. You would never know based on the entry way that there is an incredible gym tucked away on the first floor of the building. But when you walk through the doors, the space is open, bright and well kept. 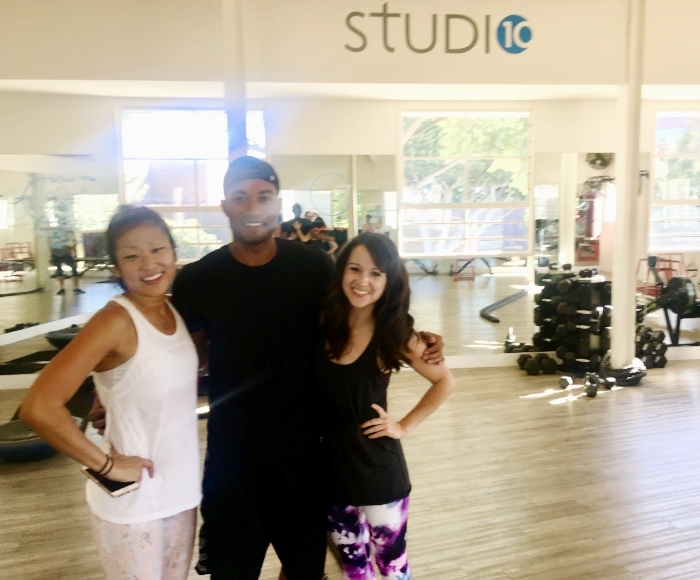 Studio 10 is a great example of a gym that proves you do not need a lot of space to have a killer workout. The woman who checked us in was very friendly and excited to welcome in some out of towners to the gym. The gym is one open room with high ceilings, lots of windows and ceiling to floor mirrors on two fo the four walls. One of my favorite features about the space is the bookshelf where you can store your belongings also doubles as a charging station with chargers provided by the studio for your phones. The instructor, Trevon, came over and introduced himself. He was friendly and welcomed us to the workout. The class had about 15 students but even with the small space, it never felt tight. The workout is set up with 10 stations. The format would be one minute per station, followed by a 90 second break after completing all 10 stations. We would do this for 3 rounds. One of my favorite things about the set up was the station number and description on the walls and mirrors. Super helpful for people like me can never remember what I am supposed to be doing at each station. Anyone who knows me knows I LOVE the ropes, TRX and anything that includes the Bosu. It was one of my favorites full body workouts in a long time. My arms were TOAST by the end of the workout. The instructor spent most of his time watching the clock (and thank god he counted because one minute felt like an eternity for this Tabata loving fitness phanatic) but if you are looking for more guidance and encouragement throughout the workout, you may need to set this expectation up front. I was lucky enough to be working through the stations with Emily so I had plenty of energy and encouragement. And I’m Lucky enough to have had enough classes with Tricia to know when to push myself and what type of modifications make things harder or easier on your joints but none of this guidance was provided in advance or throughout the workout. If you need tips on form for anything (rowing machine, TRX usage, etc.) I’d highly recommend getting to the studio in advance to spend some time asking questions and requesting extra support from the instructor. All in all, I LOVED this workout but it's definitely catered towards the more experienced fitness lover. If you're a beginner, it may not be the best match unless you are able to get there early and ask for a lot of tips and support in advance of the workout.